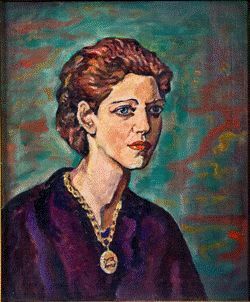 Juanita Guccione's life (June 20, 1904–December 18, 1999) spanned all but four years of the 20th Century. Cubist, realist, abstract, surrealist, and abstract surrealist strains are all to be found in her work, but by 1970 she was painting electrifying works in watercolor and acrylic that elude the most considered categorization. For the better part of her career she had been imperceptively referred to as a surrealist, but her later work abandoned the human figure and the observed world. This later work, lyrical and astral, reflected a painterly independence hinted at earlier in her career. In the spring of 2004 the People's Democratic Republic of Algeria acquired a large number of works she had painted in Algeria in the early 1930s. These paintings are now in the National Museum of Fine Arts in Algiers. It is believed that she is the first American woman artist to be so singularly honored by a Muslim nation. Guccione, then painting as Nita Rice, lived for four years among the Ouled Nail Bedouin tribe in eastern Algeria. Her paintings from this period are devoid of the flamboyant romanticism of the Orientalist painters. She painted the Bedouin as friends and neighbors, reflecting the anti-colonialist attitude of her native land. These paintings were shown in The Brooklyn Museum in 1935, receiving a good deal of press attention. When she returned from Algeria in 1935 the United States was in economic free fall. After the Brooklyn Museum exhibit, this work was then shut away as she immersed herself in an avant-garde then fomenting revolutionary artistic changes. Guccione began painting as Anita Rice, then changed her name to Juanita Rice, then Juanita Marbrook, and finally to Juanita Guccione after marrying in the mid-1940s. Guccione worked with Mexican social realist painter David Alfaro-Siqueiros on Post Office murals for the federal Works Progress Administration during the 1930s. During World War II she came under the influence of the refugee French surrealists. She studied with Hans Hofmann for seven years. Hofmann expressed high regard for her work and gave her a number of scholarships. Her mid-career surrealist paintings do not share the literary interests of many of her European contemporaries. They reveal a magical and whimsical world ruled by women. Their brilliant palette, if not their subject matter, suggests Hofmann's influence. It is in these paintings that she expresses her lifelong defiance of convention and vogue. Guccione's exhibitions characteristically received respectful attention. Her work was shown in Manhattan, Paris, Beirut, Bombay and San Francisco. But she was unusually reclusive, and this trait often thwarted enthusiasts attempting to promote and celebrate her work. Her reclusiveness, her name changes, and the critics' difficulty in characterizing her work deprived her of the recognition she might otherwise have received. Nonetheless, the respected French critic Michel Georges Michel wrote in the early 1950s that she was one of a very few American artists who interested him, this at a time when abstract expressionism was the rage and America was establishing its claim to importance in tastemaking. Describing her long career, the Washington Post art critic Michael Welzenbach wrote in 1992: "This kind of artistic evolution hardly fits into the inimically popular contemporary trend of modifying one's style to keep abreast of fashionable changes in the mainstream art world. And it is precisely this single-minded approach to her work, this willingness to follow its development wherever that might lead, that locates Guccione squarely among the few but formidable ranks of the modernist avant-garde—a group whose integrity and vision will not be seen again in this century." No one, probably not even Guccione, reckoned how restless her career had been until her works were collected after her death. Her work had always been bold and challenging, but her reputation had come to rest on the surrealist oils of her middle years, while the more productive and adventurous acrylic and watercolor work of her later years was little known. The extraordinarily reticent artist hinted at her own view of her later work when she wrote to a purchaser that she did not imagine the work, she saw it. Guccione was a gifted teacher, perhaps because of her reticence. She was able to impart ideas and techniques by guiding her students' hands, by working alongside them, rather than lecturing them. Her appreciation of painterliness was intense. The large body of work she left poses a significant challenge to fellow artists, curators and historians, and indeed a special challenge to feminists because she created in her middle years a peaceable otherworld ruled entirely by women. Of feminists she was fond of remarking, "I'm not at all interested in what they say, only in what they do." The French writer and poet Anais Nin, whose portrait Juanita painted several times, said of Juanita, "Our dreams are often diffuse and fragmented. Juanita makes them cohesive and clear, as clear as the daily world. Few people can paint the world of our dreams with as much magic, precision, and clarity. It makes the myths by which we live as vivid and dramatic as our diurnal life." Born at midnight June 20, 1904, in Chelsea, MA, a Boston suburb, to Hilda Waterman Rice and Emanuel Rice, the second of four children (Irene, 1902; Dorothy, 1906; James, 1908). Name at birth: Anita Rice. Family moves to Pittsfield, then to Great Barrington, MA, before she is 12. Family relocates again to Brooklyn, NY. Father dies. Younger sister, Dorothy, begins art studies. Older sisters Irene and Anita follow. Studies at Pratt Institute and Art Students League. Works as fashion model and pirate, memorizing and copying the designs of competing houses for her employer. Saves money to go to Europe. Goes to France in 1931, visits classes of Fernand Leger and Amedée Ozenfant but decides to go to Italy and Greece, supplementing savings by taking portrait commissions. From Greece sails to Egypt, creating a portfolio of character studies on board ship. Travels in Egypt briefly, leaving for Algeria after hearing that artists are welcome and able to live cheaply. Takes up residence in late 1931 in Bou-Saada, an artists’ colony in northeastern Algeria known as the Gateway to the Sahara and seat of famous Ouled Nail tribe. Begins astonishingly prolific sojourn lasting into 1934, occasionally traveling with Bedouins in the Sahara and frequently accompanying them on hunting forays. Produces more than 60 oil and watercolor portraits and landscapes and hundreds of drawings. At age 30 in Algiers bears a son, Djelloul, to Chehaba Ben Aissa Ben Mabrouk of Bou Saada, an Ouled Nail. When the relationship fails, takes her infant son first to England, then to New York on a tourist visa. Mother Hilda and sister Dorothy take the sickly boy in and begin a protracted and finally successful negotiation with Immigration Service and French government to keep him in the United States. In 1934 the Brooklyn Museum exhibits a portion of the Algerian oeuvre. It is greeted with a barrage of romantic tabloid press, mythologizing her life in Algeria, and respectful reviews in the more serious press. Paintings shown in the Brooklyn Museum are signed Nita Rice and Juanita Marbrook. During the 1930s she changes her name from Anita to Nita and then to Juanita. Returning to America, she anglicizes the name Mabrouk to Marbrook. Late in her life she returns to these Algerian works, and to others, and changes their signatures to “Juanita Guccione,” causing archival problems that impede her quest for recognition. Designs portions of murals for post offices and other public buildings for Works Progress Administration, including the 23rd Street Post Office in Manhattan, working with Mexican muralist David Alfaro Siqueiros. Continues studies. Paintings and drawings during this period reflect social realist, cubist, abstract and surrealist influences. During World War II is influenced by the refugee French Surrealists in Manhattan and by artists Archipenko, Gorky and de Chirico. Studies with Hans Hofmann in Provincetown, MA, and Manhattan from 1937 to 1944. In 1941 her younger sister Dorothy dies of cancer at the age of 35. In 1943 marries Dominick J. Guccione, Manhattan taxidermist and real estate entrepreneur. In November 1945 they buy a summer cottage in Woodstock, NY. Her studies with Hans Hofmann end. Work of late 1940s and early 1950s is powerfully feminist. Critics uneasily label it Surrealist, but its fabulist and astral elements elude the Surrealist canon. Exhibits this work frequently in Manhattan, Paris, Florida, California, Beirut and Bombay. Dominick Guccione dies June 15, 1959. She never again shows her earlier work. In the 1960s and early 1970s the human figure exits her work by stages, at first becoming fantastical, then deific. A fecund production of watercolors and paintings on canvas begins. The work is powerfully astral and metaphysical. She writes to a purchaser of her works that she paints the world she sees remotely, distinct from imagining them. In 1971 her older sister, Irene Rice Pereira, dies in Marbella, Spain at the age of 69. In 1972 her mother, Hilda Rice, dies in Manhattan at the age of 92. After a long relationship beginning in the late 1950s, marries Wilbert Newgold of Woodstock, NY, and Stamford, CT, in 1986; he dies in March 1989. She dies December 18, 1999, in Manhattan, having lived there continuously since 1935. Buried in Artists Cemetery in Woodstock, NY, next to Newgold. Survived by her son, Djelloul Marbrook, and her younger brother, James Rice, who dies in Paris in March 2001 at the age of 93.